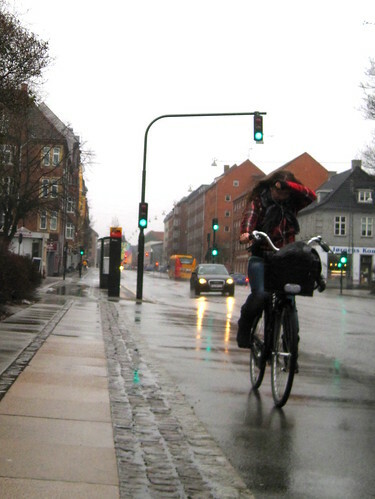 Copenhagen rain protection. The back of your hand. Keep on rolling. I'm in Catalonia at the moment. When you travel you always kind of hope the weather is crap back home, don't you? Strange but true. this picture reminds me of cycling in Germany. i think it rained for 6 months straight! well, thank god it's not. sunshine all over the place here in cph! I hope the sun come out soon ! This kind of raises a question in my mind. I see pictures all the time of Japanese riders holding umbrellas while they sedately roll on to their destination (although I seem to remember reading that this was made illegal a year or so ago), and I know from when I was in the Netherlands that many Dutch ride with an umbrella in one hand when it rains (hmm, that must mean at least half the time — sorry voor de grap!). 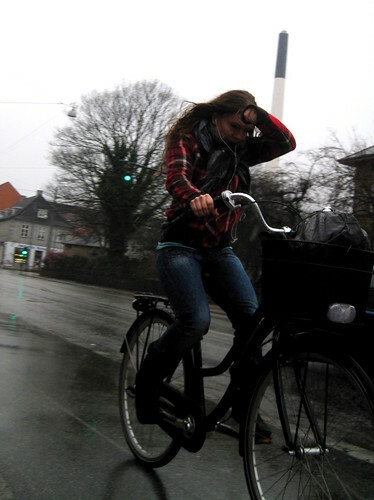 Do Danish bike riders ride with umbrellas in the rain, or is it less part of the cycling culture there? PS I hope you travelled by train, not by plane... But then if by plane, perhaps you might have a little more time to spend in Barcelona and/or Lleida, which can't be a bad thing at all! Hey, I'm here too. And you're taller in real life! It's nice to everyonce in a while see someone in CCC looking like she isn't having such a cycle chic moment. It's been extremely windy in Flagstaff this week and pedaling into the headwind, my hair has been flying around like mad and my face in a twisted knot. The weather is not always our friend. Nice shot! Looks like biking in Vancouver during the Winter! I find on an article taking about Crowne Plaza Hotel in Copenhagen. It appear that 2 cycle are install in the hall of entry and that visitor cycling to produces energy to light the hotel. When you do that you are freely fed. Tell me do it is right ? i honestly wish they were more rainy days here in SF, i think im the only californian that you will hear say that. i do love it, what is wrong with people - it's just water! That reminds me of riding in Seattle. It never stops raining there. Man that place has a nice nightlife.